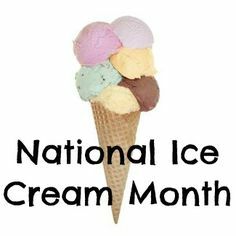 In 1984, President Ronald Reagan designated July as National Ice Cream Month and the third Sunday of the month as National Ice Cream Day. He recognized ice cream as a fun and nutritious food that is enjoyed by over 90 percent of the nation's population. In the proclamation, President Reagan called for all people of the United States to observe these events with "appropriate ceremonies and activities."